Here is the update post for my SAL project called Getting Ready. 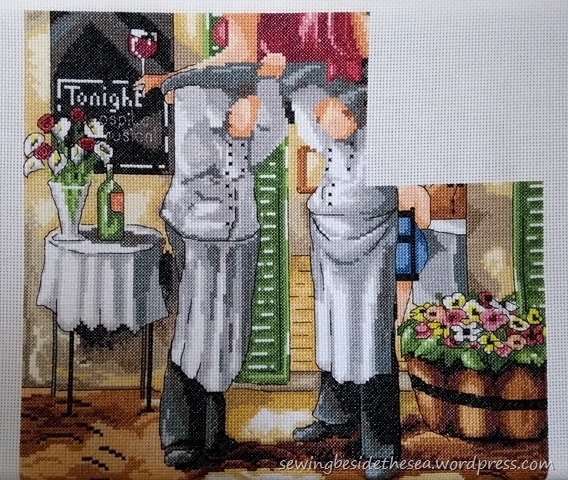 It’s from a kit by Design Works and the picture is part of an artwork by Ronald West. I’ve now got the top right corner squared off. 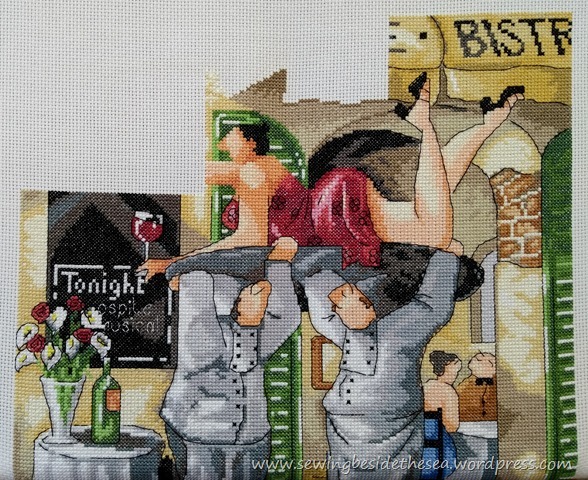 Here it is with the backstitch added. Each of the square sections I stitch are 54 x 54 crosses and I’m trying to average getting about half of one of those squares done every three weeks. 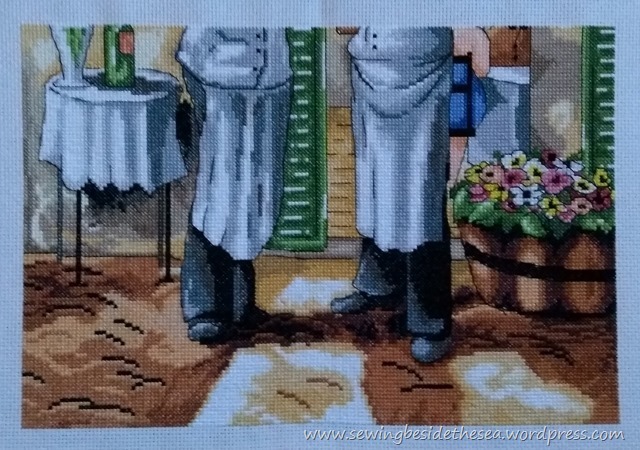 That’s 1458 crosses plus backstitch. As each cross is made up of two stitches that’s 2916 stitches or 5832 passes of the needle through the fabric. 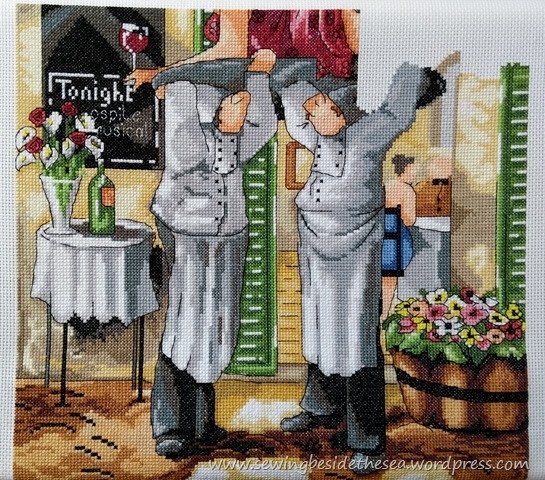 I appreciate this is nothing like the density of a Heaven and Earth Designs cross stitch on 18 count fabric but I just thought it was quite staggering what my crafty little hands get up to while I’m daydreaming. We’re welcoming Deborah into the SAL this time. Please pop over to say hello and hop around the rest of the lovely blogs by clicking the names below. 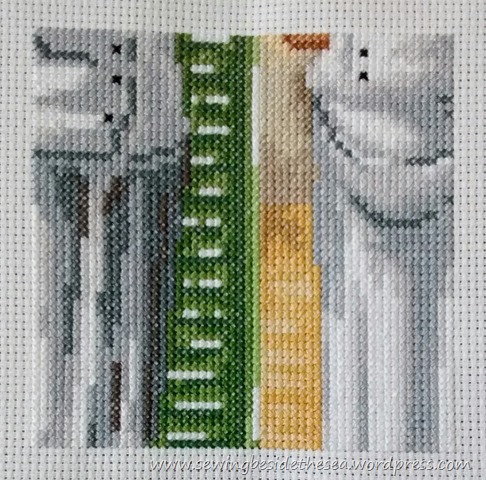 There’s a lot of really lovely stitching going on. We live all over the world so you’ll need to allow for time differences. Posting takes place every third Sunday local time. Our next updates will be posted on the 19th August 2018 when Connie will be joining us again. 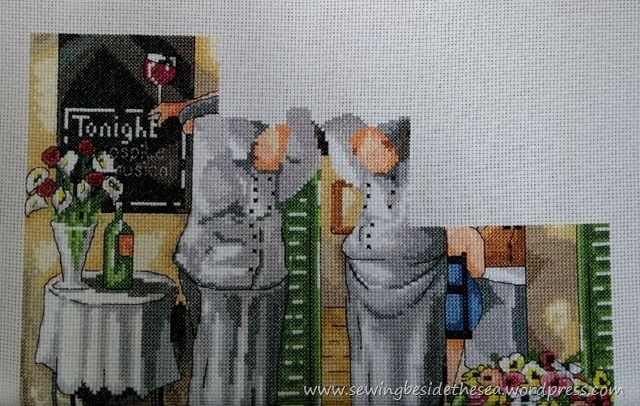 I’ve now started along the top which means the waiters have lost their legs! I’m nowhere near the finish line yet but I can feel I’m steadily working towards it. There’s no hurry to finish as I’m still really enjoying this one. 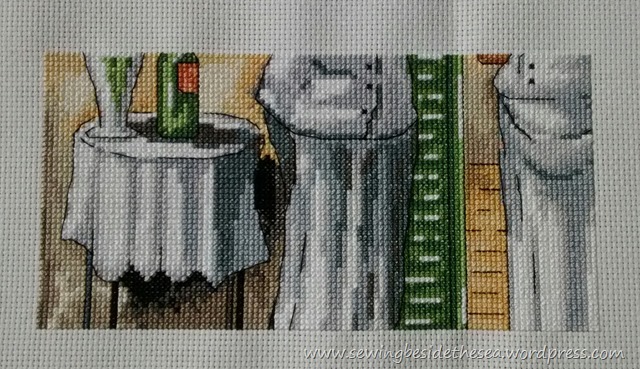 I thinks it’s the first all over stitched project that I’ve ever done. Please use the links below to see how we’re all progressing on our chosen SAL project. We live all over the world so you’ll need to allow for time differences. Posting takes place every third Sunday local time. We’re welcoming Catherine back to the group this time. Our next updates will be posted on the 29th July 2018. Here we are again. Another three weeks have flown by and I’m still working on other things but maintaining good progress on Getting Ready at the same time. This one is from a kit by Design Works. The picture is part of an artwork by Ronald West. 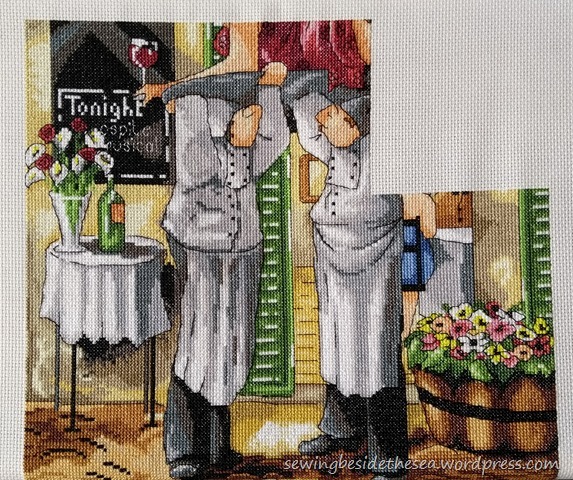 I’ve now squared off at the top right and done the backstitch detail as well. It feels good to have tidied that bit up. Now there’s another chunk to stitch across the top and that’s it. I seem to have inadvertently fooled a few of you last time. Several readers commented that there might be a happy dance this time. Sorry to disappoint. There’s still a way to go yet. Our next updates will be posted on the 8th July 2018. It’s time for another update on the SAL project today. 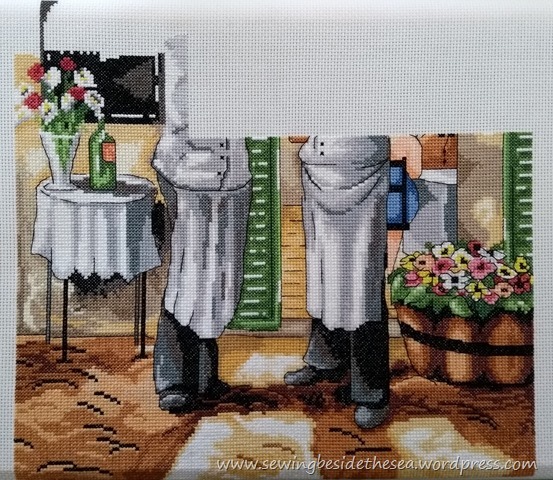 It’s from a kit by Design Works based on part of a painting by Ronald West. 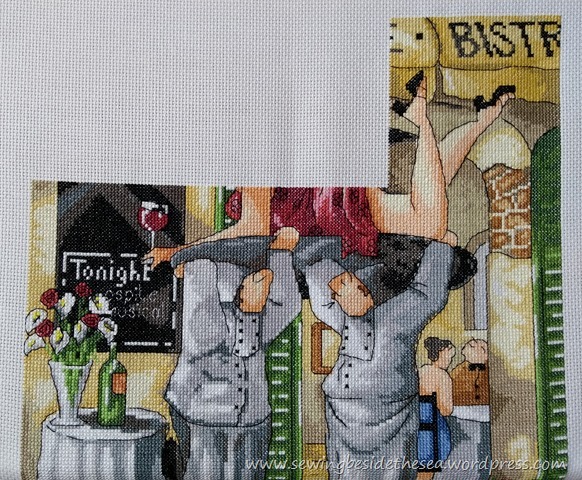 I’ve now squared off the centre bit to reveal part of a lady being held aloft! I promised last time that the peach coloured splodges would become faces with a bit of backstitch. That’s better! 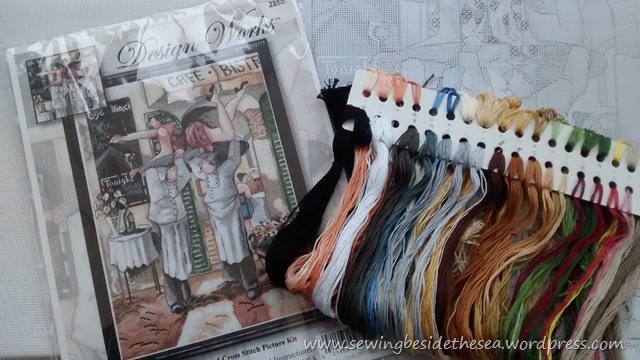 No prizes for guessing where I’ll be stitching next. Our next updates will be posted on the 27th May 2018. We’ve had loads of snow this week and I’ve thoroughly enjoyed watching all the blizzards sweeping across from east to west because I was lucky enough to stay at home most of the time. It’s the type of snow that’s very dry rather than dirty and slushy so it’s nice and easy to walk on. Unfortunately it’s a bit too dry for building snowmen or I’d be out there having fun! Anyway, I’m doing that very British thing (apparently)…talking about the weather, so I’ll get on with what I’m supposed to be showing today. This is where I was up to last time. The picture is called Getting Ready from a kit by Design Works. This is how far I got with the next square. 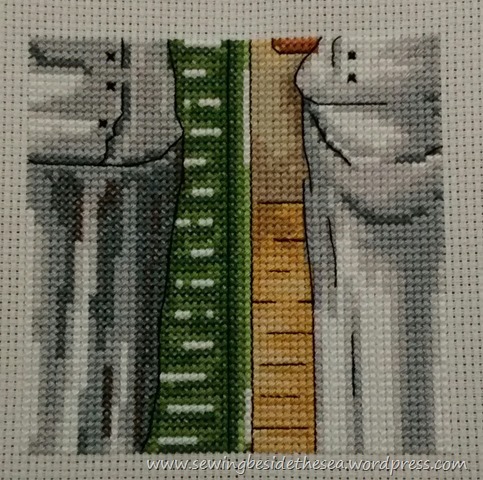 The bottom has now been scrolled around the frame so you won’t see that bit again until it’s all finished. 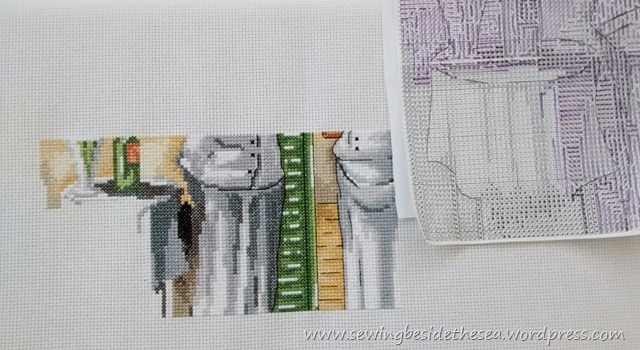 I’ll be continuing to stitch the blackboard on the left for next time and I’ll hopefully get the backstitch completed on this section as well. Our next updates will be posted on the 25th March 2018. It’s time to show you an update on my SAL project today. The design is called Getting Ready by Ronald West and it’s a Design Works kit. This is where I was up to last time. I’d completed 1/12. 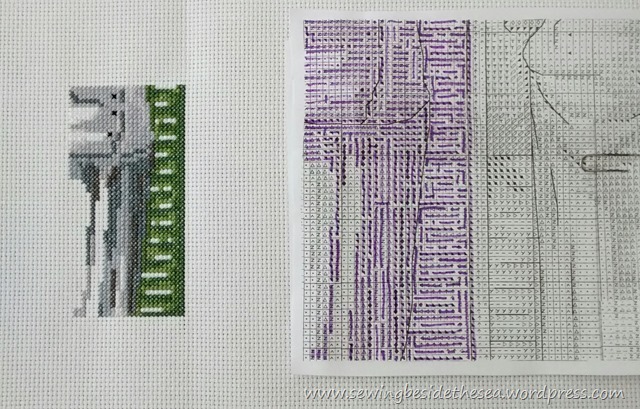 This time I started stitching to the left of the last section. I managed to finish another 1/12. 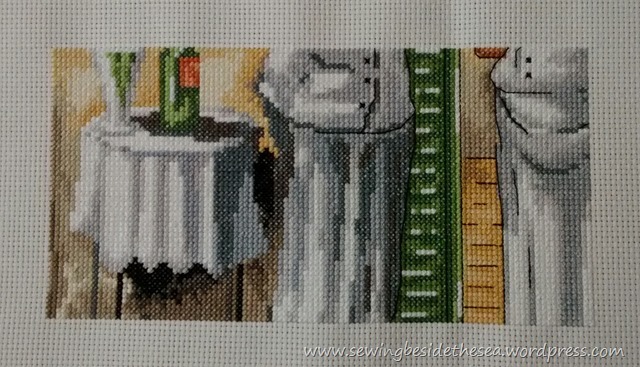 Here it is with the backstitch completed. So that’s as far to the left as this one goes. One sixth complete. Next I need to work to the right and that will be the full width of the design done. 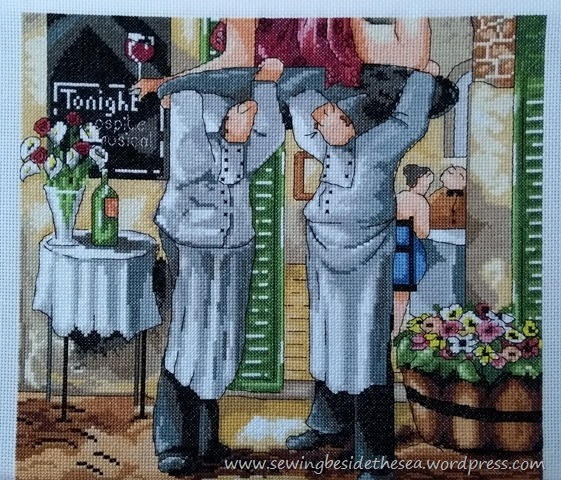 Me and Claire are stitching the same kit but we’re stitching different areas each time. Everyone else in the group is doing something different. Please take a look at how they are progressing with their own chosen SAL project. I promise you won’t be disappointed. We live all over the world so you may need to allow for time differences but we post local time, every third Sunday. Our next updates will be posted on the 19th November 2017. See you then!